If you stay here, you get a discount at the restaurant and it's a good deal. Spacious clean room. Very hard to find hotel with lots of space. My room was upgraded. I had a really nice view. The bed was so comfortable. The cleaning staff were great! Staff are very accommodating... and although late request they still granted my request of early check in and late check out. 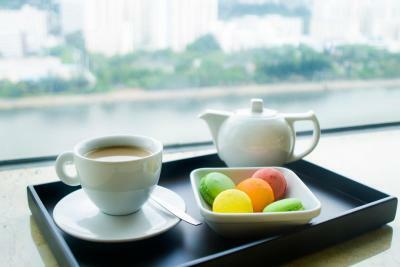 There is river view from our room and the environment is excellent, the restaurants nearby have delicious food. 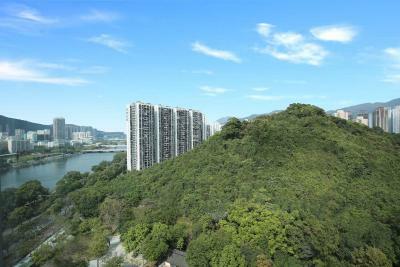 Beautiful view of the city , it’s near an mtr & bus stop which makes it easier to travel. For an additional fee 95$ , you can get a buffet breakfast. We enjoyed as it had a nice variety & healthy western options. Staff was helpful & friendly. The room is clean. Overall we’ll stay here again. 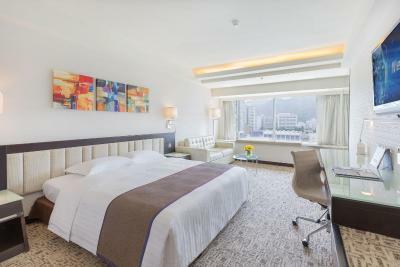 Large and spacious rooms which is not normal in Hong Kong. 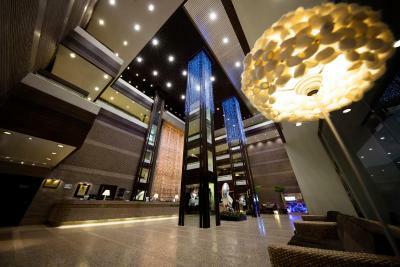 Regal Riverside Hotel This rating is a reflection of how the property compares to the industry standard when it comes to price, facilities and services available. It's based on a self-evaluation by the property. Use this rating to help choose your stay! 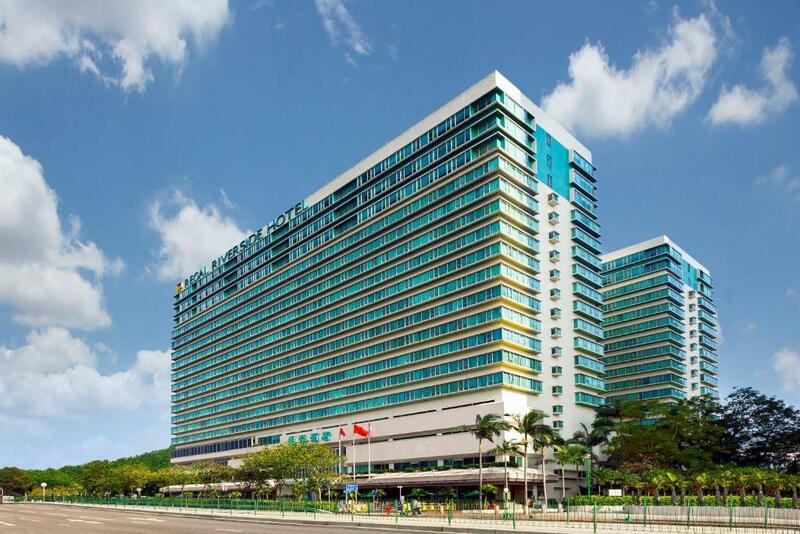 Only a 10 to 15 minute walk from Sha Tin Wai MTR Station, Regal Riverside Hotel features views of Shing Mun River which is lined with beautiful vegetation. 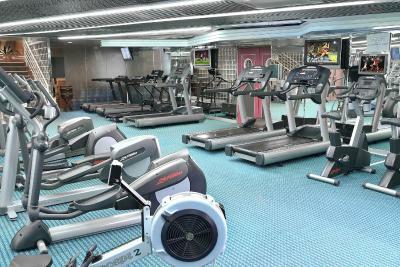 It offers 11 dining options, an outdoor swimming pool and a spa. 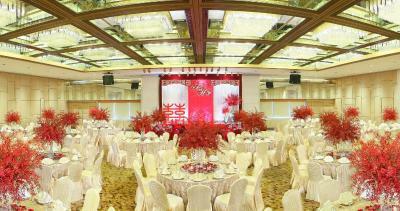 There are also 13 function rooms and 2 grand ballrooms at this hotel. 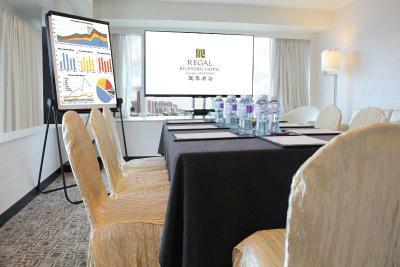 Hong Kong International Airport and Hong Kong Disneyland are a 30-minute drive away from The Regal Riverside. It takes 25 minutes by MTR from Sha Tin Wai MTR Station to Tsim Sha Tsui East. 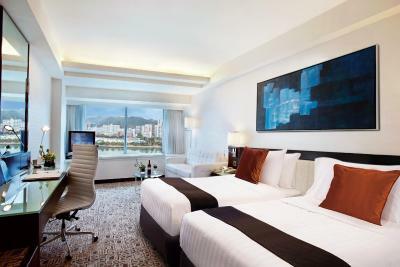 Bright and spacious, the rooms come with a cable TV, a safety box and a mini-bar. Private bathrooms provide facilities like a bathtub and a hairdryer. 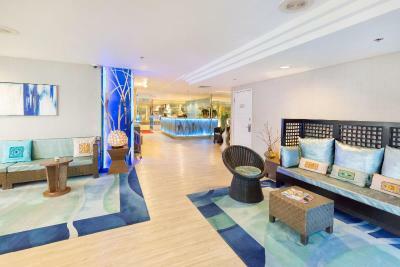 OM Spa offers massage and a menu of luxurious spa treatments. 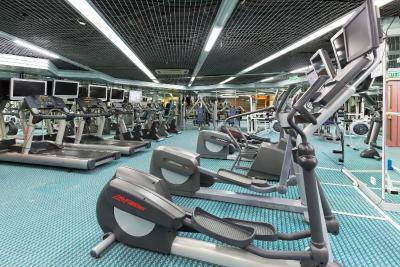 Other facilities at Regal Riverside Hotel include a well-equipped fitness center and sauna. Dining options range from an international buffet spread and Italian dishes to Chinese specialties and Japanese favorites. Carnival Bar offers a selection of beverages, while Regal Patisserie serves cakes and desserts. 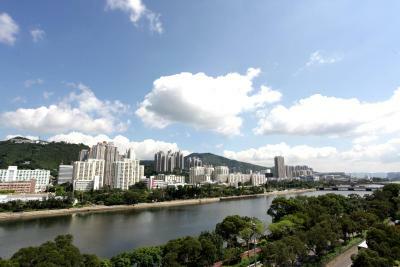 Shatin is a great choice for travelers interested in gourmet food, clothes shopping and shopping. 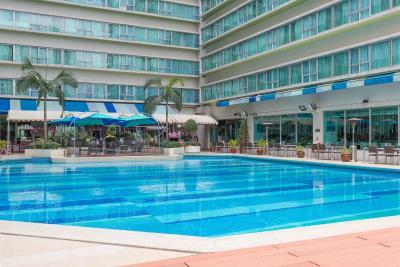 When would you like to stay at Regal Riverside Hotel? 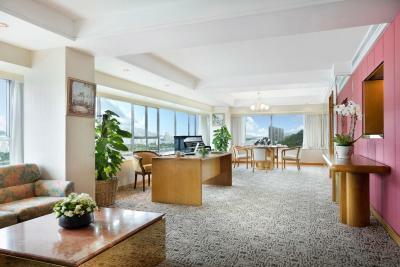 Enjoying city or garden views, this air-conditioned room has a cable/satellite TV, mini-bar and personal safe. Private bathroom has a bathtub. 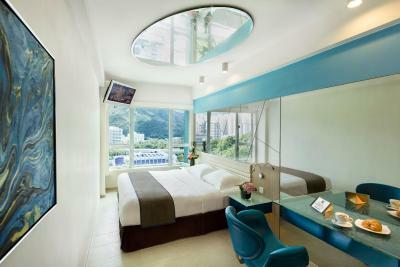 Free in-room Wi-Fi service for up to 2 mobile devices per day. 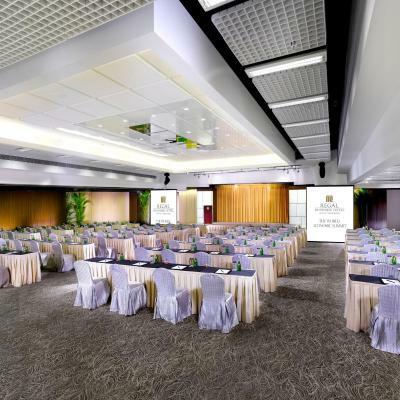 Private parking is available on site (reservation is needed) and costs HKD 200 per day. This air-conditioned room has a cable/satellite TV, mini-bar and personal safe. The private bathroom has a bathtub. This room can only accommodate up to 2 adults. No child can accommodate in this room type. Enjoying mountain views, this air-conditioned room has a cable/satellite TV, mini-bar and personal safe. Private bathroom has a bathtub. 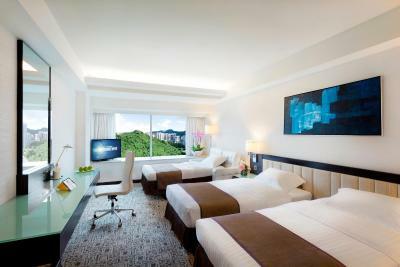 Free in-room Wi-Fi service for up to 2 mobile devices per day. This air-conditioned room comes with cable/satellite TV, mini-bar and a personal safe. The private bathroom has a bathtub. 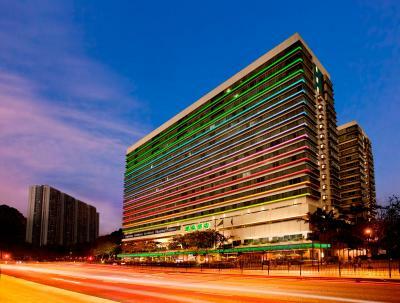 Free in-room Wi-Fi service for up to 2 mobile devices per day. This room can accommodate up to 4 guests. Extra guests including children are not allowed. This triple room has a mini-bar, air conditioning and cable TV. Free in-room Wi-Fi service for up to 2 mobile devices per day. This family room has a seating area, satellite TV and mini-bar. 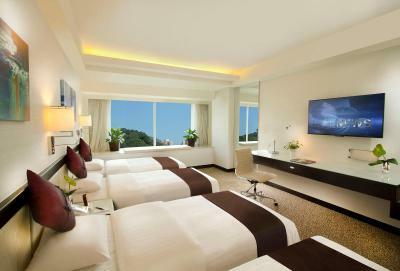 Free in-room Wi-Fi service for up to 2 mobile devices per day. This 52-square-yard suite includes a separate and spacious living room, a bedroom with a king-sized bed and an oversize bathroom. 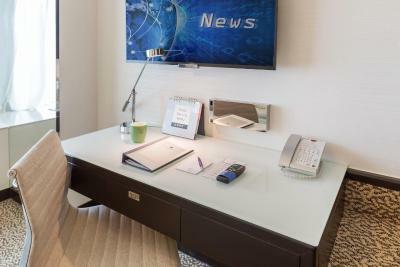 - Free scheduled airport transfers to and from hotel for up to 2 guests, in-room Wi-Fi service for up to 2 mobile devices and mini-bar. 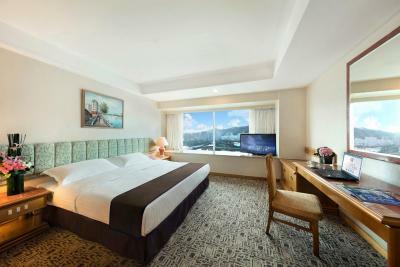 Premier Room is beautifully appointed in a contemporary style offering a sense of chic and stylish touch. 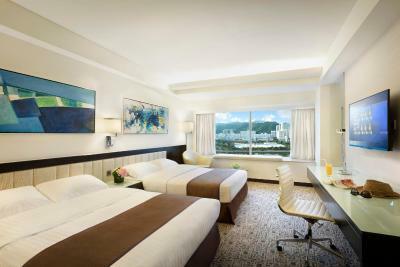 Located on the higher level of the hotel, the sophisticated room is available in double-bed or twin-bed setting with panoramic views which lets you experience the vibes of Shatin. Free mini-bar per stay is offered. 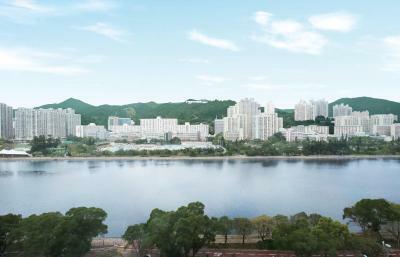 Presidential Suite features a panoramic view of Shing Mun River and luxurious furnishings including distinct living and dining areas, two comfortable bedrooms, a full kitchen and a spacious washroom with spa bath, delivering discerning guests a touch of modern elegance. 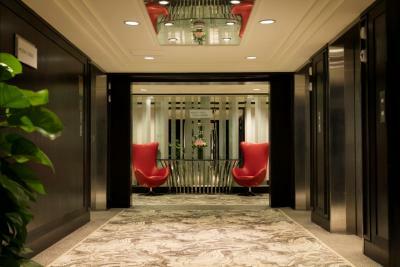 Your stay can further be enlivened with an exclusive access to a designated area to enjoy free continental breakfast, afternoon tea and evening cocktail. The area offers you personalized check-in and out along with spectacular river and mountain views where you may appreciate a prestigious recognition. 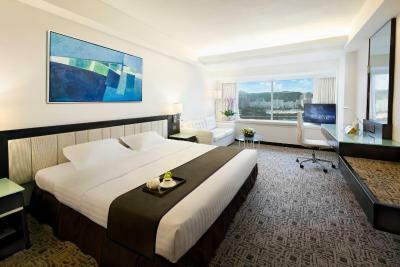 Other complimentary privileges include shuttle bus service to/from HK International Airport, in-room Wi-Fi service and many more for providing you greater degree of flexibility and convenience during the stay. 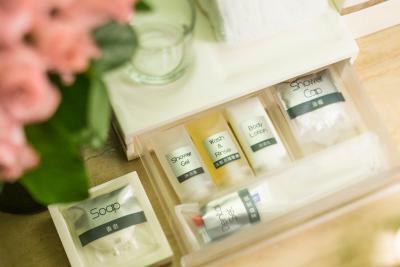 -Complimentary in-room WiFi for maximum 2 pieces of device. This twin/double room has a seating area, mini-bar and air conditioning. This double room features a satellite TV, mini-bar and air conditioning. 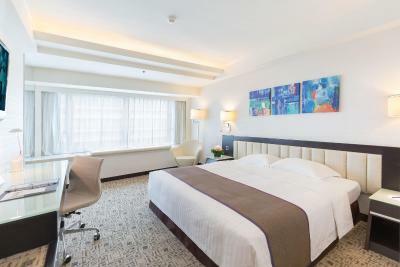 The spacious Connecting Room features two connected rooms available in twin beds plus a sofa bed along with amenities for 3 people per room. Entertainment facilities include a 42-inch LED TV and a deep-soaking tub in the bathroom. 2 children up to 11 years old can stay on existing beds for free. Please note that rollaway/extra bed is not available. 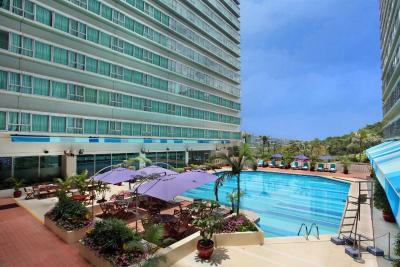 Hotel surroundings – This neighborhood is a great choice for travelers interested in gourmet food, clothes shopping and shopping – Check location Good location – show map Guests loved walking around the neighborhood! House Rules Regal Riverside Hotel takes special requests – add in the next step! 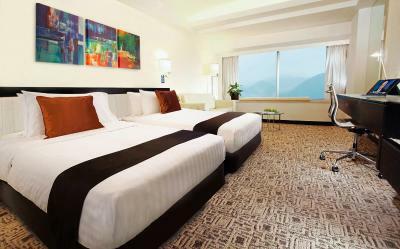 One older child or adult is charged HKD 330 per person per night in an extra bed. Regal Riverside Hotel accepts these cards and reserves the right to temporarily hold an amount prior to arrival. Please kindly note that the hotel will become a totally smoke-free hotel from 1 June 2019. Extra beds are subject to availability. Guests checking in at or before 12:00 at noon will be charged an additional fee. When making the reservation, please provide the credit card holder's name in English. Please note that name on the credit card that is presented upon check-in must match the name on the reservation. Please present the same credit card used to guarantee your booking when checking in or making payment at the hotel. 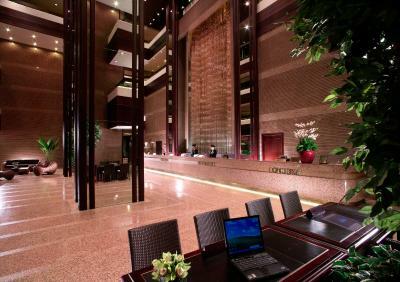 Hotel offers free internet access for up to 2 mobile devices per day in all guest rooms. The third device may be charged per IP per day. Please note that WiFi in public area and restaurant is free only for 30 minutes per mobile device per 24 hours. 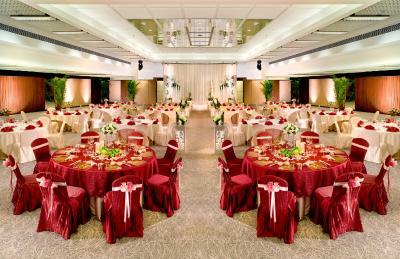 Please note that the hotel provides shuttle from Shatin Station to the hotel effective on 1st May 2017, which costs HKD$10 per person per trip. 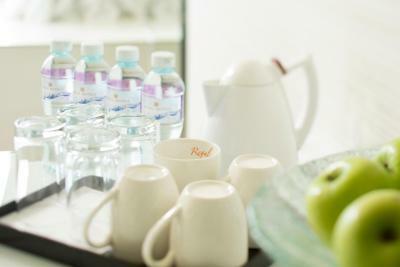 Please note that when guests book more than 5 rooms, different policies and additional supplements may apply. For more information, please contact the property in advance. We got WiFi just for two persons and we were four. When we got there everything in the room was for two persons not for four. The night concierge Reachel was using his phone for a while until I had to get his attention. And he sounded like he didn’t want to help us. The electricity adapters were a problem because we had to purchase two 40 HKD each. The wifi was limited to only two unless we paid for use of wifi for more devices. The cleaners cleaned our rooms quite well and the rooms provided us everything we needed. There was also lots of thing to do at the hotel. One of the problems we had was the limited wifi to only two people unless we paid for it. 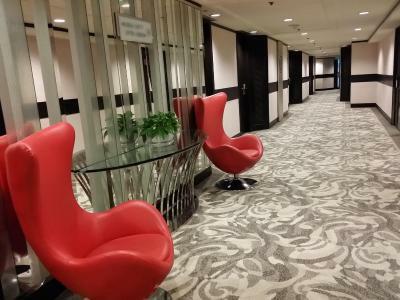 The cleaners cleaned our rooms very well and the rooms provided us everything we needed. There was also lots to do in the hotel as well. we can still smell cigarette smoke even we were on non smoking flr. staffs are friendly n polite. The toilet bowl is not stable. Hair was found on the shower’s wall. A bit distant from the nearest subway station. 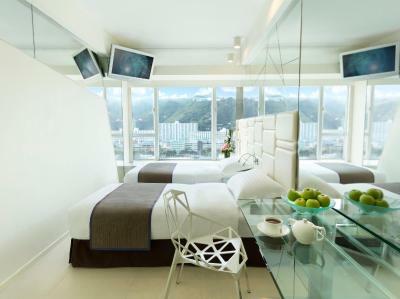 Clean, modern, reasonable price for Hong Kong. Great pool. Only 2 plugs in the room. I had to buy. Multisocket plug. It’s a bit grubby. Everything is well worn and it needs a deep clean. Love the location. Slightly out of the busy along a lovely river. Great for walking. Rooms are large. Great happy hour(s). I would like to rebook again but prices were too high which was out of my budget. Nothing. Have stayed at this hotel before, would have no issues staying here again. Swimming pool. Staff friendly and approachable. Transport close by. A variety of different places to eat. Shopping centre close by. Last experience told us this hotel was good at location and old decor. This time we lodged here and everything was getting worse. We had long flight from UK to HK, and checked in , they gave us a unqualified room which was full of smell, so stink. 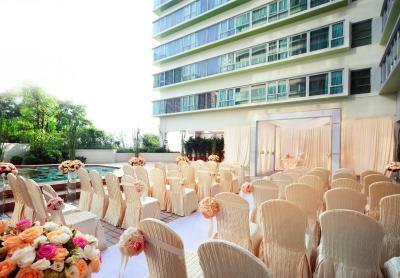 We reported the reception, a staff with air refresh was send out to us. But I had no energy to deal with them, too tired. Second day I asked for changing the room, they needed us changing ASAP otherwise could not guaranteed us a clean in the afternoon. Well we moved quickly and went out for our appointment, but accidentally the shower liquids leaking in the duvet till we back later night. The next morning we talked to a housekeeper and she reported to manager who came and checked and asked another manager to discuss then shouted walkie walkie useless manager coming doing nothing and another manager coming , asked him to quote how much we need compensate. I told them it is a liquid , can be washed away , they asked us to clean it 😡😡😡. Anyway, we washed it as they offered us. I won’t trust this hotel any more, horrible experience. I would not recommended any family in this hotel. Very bad, not clean enough . And any time ask you extra as well. The mattress was rugged, the window curtains were full of stains. A couple of years ago lived here. The bed was comfy and the shower was nice. The first room we got in looked really old, like we were getting into a motel more than a hotel. When we got in, everything felt like dirty, but we were very tired as we got to the hotel at around 23:00 PM. The next morning we noticed there was MOLD everywhere. Specially the air vents and the bathroom AND I found a booger in my towel. We talked to the reception and got changed to a different room immediately, they didn't even check the room, which makes me think they know about the issue. When we were leaving the first room, the cleaning lady supervisor walked by and we told her about the mold and she said those parts are as clean as possible because of water lands on a surface and it's not dried immediately, it gets moldy and it can't be taken out.. to my opinion that's a really bad answer. The second room was cleaner, but we noticed there was still a lot of mold around, but at least not in the air vents. It was dirty, but not moldy.